Sketch by Martha King 1803?-1897. Inscription reads: " House we halted halfway to Porirua August 28, 1849." Corner of present day Glenside Road and Stebbings Road. 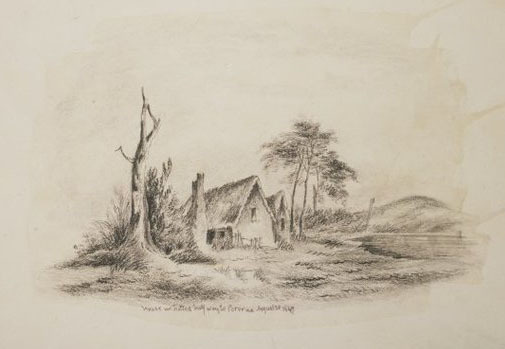 Was this once the site of the Wall's Halfway House, as sketched by Martha King? The corner of present day Glenside Road and Stebbings Road. An archaeological investigation revealed this to be a pre 1900 house site. This is the story of Susannah Wall nee Dowedeswell (1805-1873) and Anthony Wall (1800-1879) who lived at The Halfway, now Glenside, from 1841-1849. Their home was the first Halfway House. Most of the information for this article was sourced from the book Anthony Wall, settler of Porirua: The Papakowhai Story by Barbara Kay, published by the Organising Committee for Wall Family 150th Reunion, 1996. The Wall family originate from Etwall in Derbyshire, England. They migrated to New Zealand, departing from London on the sailing ship Lord William Bentinck, in January 1841, arriving at Wellington in May 1841. The Wall family geneology in Derbyshire can be traced back many hundreds of years to at least the early 16th century. “Generally speaking, the Walls had lived, married, raised their children and died within reach of Darley or Darley Dale...” Barbara Kay wrote, noting the strong presence of the Wall family name in the local Church of England records and the Church burial sites. George Wall (1756 – 1827) married Sarah Wright (1758-1846) at Duffield, Derby in 1779 and they had 12 children. Anthony Wall was the tenth born and the youngest son. His father did not live to see him married or know that he had travelled to New Zealand. Anthony Wall (1800-1879) married Susannah Dowdeswell (1805-1873) on 29 December 1828 in Brailsford, Derby. She is believed to have been his second wife, and his first born daughter is thought to be from this first marriage. The Wall family have a history of being yeoman (a freeholder, holding and cultivating a small landed estate) and tenant farmers. A tenant farmer did not own the land, but retained tenancy of it when the land changed hands. Anthony and Susannah were tenant farmers at Etwall in Derbyshire. Etwall is a small village in Derbyshire, midway between Derby and Burton-upon-Trent. The Etwall Village website informs us that population census figures for Etwall at the time would have been around 500. On 20 January 1830 the Wall’s tenant farm was auctioned. An advertisement of the time described it has having 57 acres of arable and pasture land and plantations, outbuildings, a garden, and orchard. It’s unclear whether the Walls stayed on as tenants or if Anthony went into partnership with his brother Charles. His brother Charles (1786-1868) and wife Ann Mellor (1792-1861) were living on Pear Tree Farm in Etwall. The Pear Tree house and farm were situated in the centre of Etwell close to the Spread Eagle Inn, an old hostillery with parts of its structure dating back to the 16th century. There is a family history that the brothers were farming Pear Tree Farm together and a disagreement between them led to Anthony’s decision to emigrate. Regardless, the two brothers stayed in contact and the New Zealand branch of the family returned to Etwall many times over the next 150 years to visit their relations. The Wall family sailed out to New Zealand on the Lord William Bentinck, departing from London on 7 January 1841 and arriving at Wellington on 19 May 1841. Anthony was 40 and Susannah 35 but they listed their ages as 34 and 30 to meet the New Zealand Company’s age restrictions. On the emigration registrar, Anthony listed his occupation as an agricultural labourer. The family were allocated Berth No. 43. Berth No 45 was occupied by friends, John and Charlotte Martha Whitehouse and their four children. The Whitehouse family lived next to the Walls at the Halfway. “Just a few months before the family’s arrival, the Company had begun work on the opening up of the 'Porirua road', as they were to call it. Within a month of the family’s arrival, in June 1841, the Company had the first of their one hundred acre sections along the road surveyed and ready for “selection” (1996, p2). “Anthony, along with his friend John Whitehouse, with whom he had travelled out below decks on the Lord William Bentick, was not in the market for any one hundred acre sections. It made sense for both of these men with their limited means to look for smaller lots of reasonably priced land on the outskirts of the Wellington settlement. It also made sense because the land was on the route north, where prospects for the future were good. By 1841, the New Plymouth and Wanganui settlements had also been established and it became obvious that the Porirua track would become the principal route to the north, and Wellington the principal town" (1996, p34). Anthony and John Whitehouse were both able to buy land from early settler Frank Johnson, who had sub-divided his Section 24 100 acre block into several 8 acre blocks. “Their eight acre bush-clad strips of land alongside 'the track' to Porirua were next door to each other. These sales were not registered until 23 March 1843, but agreement to the sale would have been in place before the family moved in” (1996, p34). The family had to wait in Wellington until their house was built, and guided by comments in a Susannah wrote to her sisters in England, Barbara Kay felt it was likely that they moved out to the Halfway in the spring of 1841, once winter was over. “The farm was small but they owned it. As Susannah said. They were ‘about half way betwixt Wellington and Parrarua distance of twelve miles’ and so their first home became the ‘Halfway House’" (1996, p34). It was not much better five years later. “In 1846, William Reeve said 'his goods and chattels were carted up the old Kaiwarra road by Johnny Martin, then conducting a primitive carrying business, but the road was not completed to Johnsonville and the stuff had to be packed for part of [that] distance, either on horseback or man back, most frequently the latter'" (1996, p37). “After a steep descent the track opened out into a naturally undulating area alongside the Porirua Stream. This flatter area was the Halfway, which became the customary resting place for travellers before or after the climb in and out of Wellington. It was there, where the bush opened out and the track skirted close to the stream, that the family settled" (1996, p36). “The track was the family’s lifeline to the nearest settlement, Wellington. Their home was in the bush and their land had to be cleared of forest before they could plant the necessities of living. Anthony and Susannah’s home was, as she said, ‘the only house that is near the rode’, and it was to become a welcome sight to all those who walked the track to Porirua. The travellers gave it the name of 'The Halfway'. Today the name for this area is Glenside” (1996, p37-38). “The first bush licence at the Halfway was issue to John Lodge, who owned the third eight-acre strip of land there, alongside Anthony [Wall] and John Whitehouse. Bush licences were issued for the sale of liquor without any rules for accommodation. Lodge held the licence for some years, until he sold his eight acres to Captain William Barnard Rhodes in 1845. It was then Anthony took over Lodge’s licence ‘for one year’ on payment of five pounds. There is no further record of Anthony renewing that licence or of a change of ownership. A 'Special Publican’s License' was issued to John McKain, followed by a 'bush licence' a year later”(1996, p39). In 1842, Susannah wrote a letter to her sisters describing life living on the road to Porirua. The family cleared land to grow food and raise poultry, and pigs, and had two cows and a cow calf. Susannah learned Maori so that she could trade with the people walking by. She wrote "I keep beds and refreshments for travlers" (sic). Anthony and the oldest son, 11 year old George, took on additional work as labourers and the younger children went to school. Susannah wrote of a neighbour who had died, and been buried across the stream. She wrote of the burial site being blessed by Bishop Selwyn when he was walking by, on his way north, on 10 October 1842. 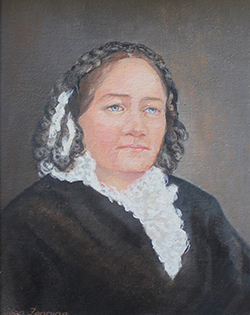 (In 2013 a memorial dedicated to this unnamed woman, near the burial site, was unveiled by the Glenside community, Wellington City Council and invited guests). In 1846 there were troubles along the road associated with settlers encroaching on Ngati Toa strongholds. Anthony and George volunteered with the local militia. 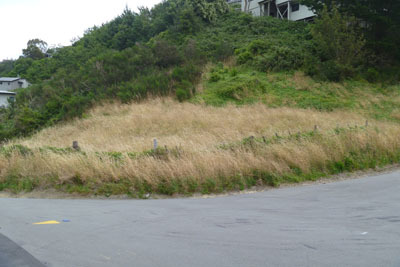 During this time a series of stockades were built along the Porirua track and the track was upgraded into a road. In 1847, Mrs Branks, who lived with her husband and three children, near the Walls on Section 24, was struck by a tree being felled by her husband. She was the first patient admitted into Wellington’s newly opened public hospital. She died as a result of her injuries. Sixteen months later the John Branks and his three children were killed by a man using an axe as a weapon, as they lay in their beds sleeping. The suspect, a recently released prisoner, was arrested and hanged. In 1849 the Wall’s sold out to McKains and moved north to Paremata at Porirua. Four years earlier, in 1845, the Wall’s had bought, by agreement, part of section 56 which lay further north along the Porirua track. Settlement took place on 26 February 1848, when the purchase was extended with another 50 acres. Over time the Walls purchased neighbouring sections 56, 58, 59, a sub-division of 57, and 61. Anthony and Susannah Wall did not live on this land, their son James and his family did. Today the road 'Wall Place'at Linden marks the base of the hill where the farm homestead was situated. When the Walls sold out to McKains in 1849, they moved north to Porirua, where they lived in a cottage at Paremata (Papakowhai). 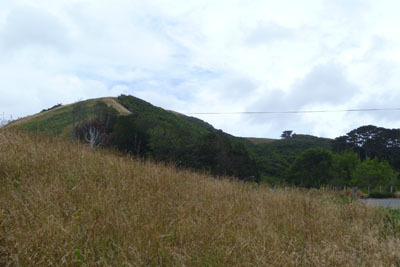 From here they extended their land holdings, including lease-land at Pukerua and farmland north of Martinborough in the Wairarapa. Eventually they enlarged their cottage at Paremata into a substantial homestead, which is today known as the Papakowhai homestead, and is situated off Bowlers Wharf Lane. Susannah died in 1873, after which Anthony persuaded her unmarried sister Dorothy to emigrate from Brailsford in Derbyshire and join him in his old age. Anthony died in 1879 and was buried alongside his wife at St John’s Anglican Church at Johnsonville. Sarah (1828-1865) m Walter Price (1834-1865) and is buried at St John’s Anglican Church, Johnsonville. George (1830-1903) m Sarah Hulbert(1834-1886) then Margaret Martin (1842-1894). There were 11 children. John (1831-1903) did not marry. 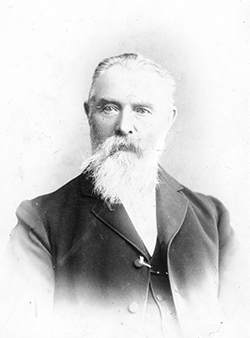 Anthony (1837-1901) m Charlotte Elizabeth Stace (1844-1932) and had nine children. James (1838-1922) m Emma Floyd (1848-1921) and had six children.